KIEV, Ukraine -- Ukrainian State Space Agency informed that in 2011 Ukraine joined China, the EU, Russia, and the USA becoming one of the top five space rocket launching countries in the world. Ukrainian Zenit 3F rocket at Baikonur, Kazakhstan. Since 1991 Ukraine grew into a significant player in the field of space industry, having launched 125 rockets and delivered into orbit 238 satellites that belonged to 19 countries. As of today Ukraine has launched its rockets from four space launch facilities across the globe. 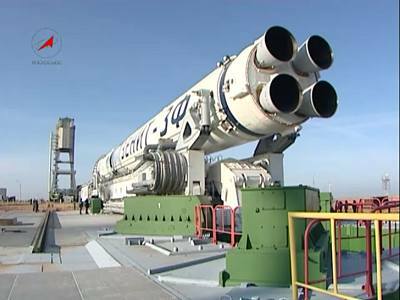 By 2013 the country will start using the fifth launching platform for rocket launches as a joint Ukrainian-Brazilian project Alcantara Cyclone Space will be complete. The binational project will provide a launching facility in one of the most advantageous locations on the planet. The platform in Brazil will be located in close proximity to the equator (2°17′S 44°23′W). Thus, the Ukrainian Ambassador to Brazil Igor Grushko noted that the Alcantara Cyclone Space project is set to be a prosperous venture. The cost of rocket launch from this location will be 20 percent less than average. Ukrainian space launch vehicle became a part of the international project for extragalactic research. On July 18, 2011, a Ukrainian Zenit-3M rocket was launched from Baikonur, Kazakhstan, to carry the Russian astrophysical observatory Spectrum-R onto a unique orbit around planet Earth. Unique technical characteristics of Zenit-3M allow carrying up to 14 tons cargo onto low orbits, which was crucial for the mission. Ukraine is one of the three successors of the Soviet Union's space industry, the two others being Russia and Kazakhstan. Ukrainian space industry companies utilize most of the known space technologies and participate in 50 international space projects. Being one of the top five space savvy countries in the world, Ukraine owns a complete rocket production cycle. It occupies one of the top positions in the global industry of rocket launcher production. Ukrainian SDO Yuzhnoe produced over 400 Earth satellites. In 2004 alone Ukraine administered 7 lift-offs, making it 13 percent of all rocket launches from the planet during that year. Under the ambitious project Selena Ukraine is set to send its own scientific satellite to the Moon in 2017, according to the advisor to the chairman of the State Space Agency of Ukraine Eduard Kuznetsov.